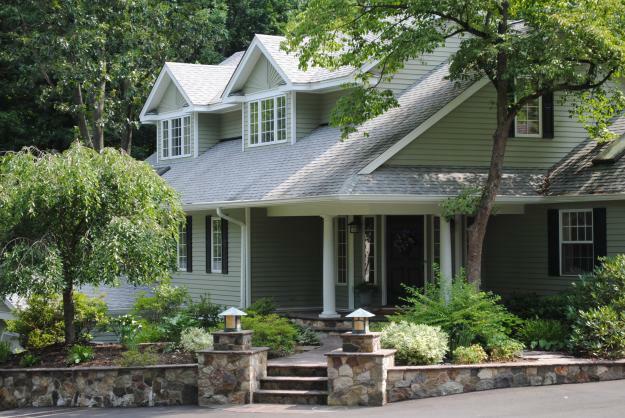 Choose your stone material wisely for your front walkway and landing. Consider color, texture, durability and style when picking out a hardscape material and choose something that reflects the character of your home. Stone landscape pavers, for instance, are a great choice for high traffic areas, but may shift over time depending on location and drainage variables. A wet-laid bluestone patio is another great choice, but may heat up to the point of discomfort in full-sun during the summer. Since this material will be the foundation of your front yard landscaping, consult with your landscape designer about which one is best for you. Always ask for samples of material and request to see neighboring projects to see how such material has worn over time. Construct a tasteful planting scheme around the walkway and landing. The plants you choose should complement the architectural style of your home, and have a variation of height, color, and texture. Also consider what the plants you choose will look like throughout the year. All varieties of Boxwoods, Hollys, Yews, and Rhododendron, for example, keep their foliage year round, giving your front yard a constant touch of green. Other front yard favorites such as Azaleas and Dogwoods lose all or most of their leaves in the winter, but will provide a burst of color in the spring and summer. Diversify the types and characteristics of the plants you choose so you can get the best of all worlds. Keep your front path clear and inviting. Don’t install plants, especially those with vines or thorns, too close to the pathway to avoid a nuisance or tripping hazard. Your guests, neighbors, and postal carriers should know immediately the best way to get to your front door. Otherwise you may find them trailblazing through other parts of your landscaping causing unnecessary damage. 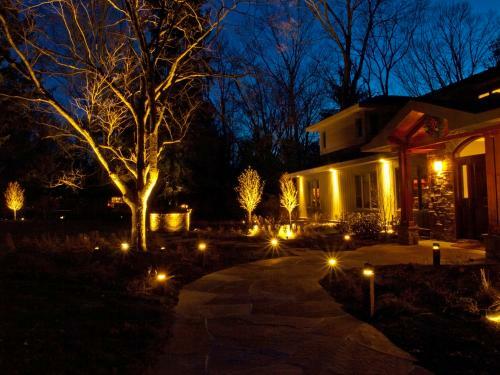 Explore the benefits of outdoor landscape lighting. Aside from the obvious aesthetic value of a beautifully lit landscaping, a landscape lighting system will add value to your home. But outdoor lighting systems add more than curb appeal. A well designed, landscape lighting system can help protect your home from burglars and other mischievous persons after dark. And with the many energy-efficient LED lighting options on the market today, keeping your property lit into the wee hours is not nearly as costly as it used to be. 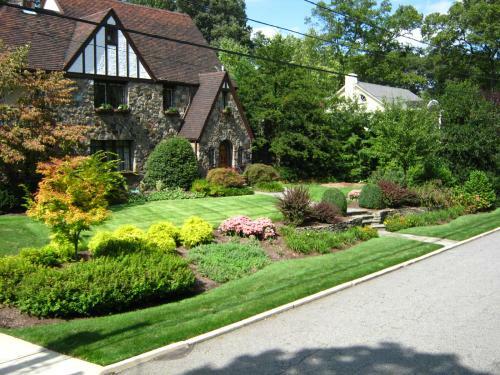 A thoughtful, well-designed front yard landscape renovation can be fun and rewarding. Making improvements to this often overlooked outdoor living space will pay dividends as and will be enjoyed by your family, neighbors and anyone who should have the pleasure of finding themselves on your doorstep. Do you perform work in Cranbury? I'm looking for a good dry-stacked fieldstone retaining wall contractor. The wall will run across the front of my property line (say 120 ft) and will be short (say 2ft face exposed). Will really make the house and we are on main street. Nice... very visible project. I appreciate your suggestions for taking my time when choosing pavers for my front walkway. I want to make sure it looks nice, is durable, and doesn't get too hot. Me and my kids like to go barefoot in the yard when we can. What pavers stay coolest in the summer heat? Keeping the pathway clear is a good idea. That way your home will look much more welcoming. And, welcoming homes always seem to look more warm and comfortable. So, making a clearly defined pathway is great idea! Highlight fantastic blossom beds with decorative grasses. Make a little front yard seem greater with restricted blossom beds. Brilliant annuals, fragrant perennials, evergreens and decorative grasses keep these clean bloom beds delightful amid all seasons. Incorporate certain plants to pull in winged animals and butterflies for a touch of nature in even the littlest settings. I love that outdoor lighting can really make a home appear more warm and inviting! It would make your home feel more comfortable, and it would just feel homier. It is crazy how something as simple as outdoor lighting can do that to a home. I would like to get some help on cleaning out my back yard. I would like to be able to improve my landscape. I want to be able to get the trendiest designs. I agree-- no matter how you want to design your place, I recommend keeping your front path clear so that your guests know where your front door is. This also makes them feel welcomes. You idea of landscape lighting was also great. The picture you posted is the exact image I envision when I think of an inviting and creatively architectured home. Thanks for bringing to my attention that keeping pathways clear is important in a landscape. My husband and I just moved into a new house, and we want to redesign the yard. We'll make sure to keep the pathways clear of plants, and if we do put some close to it, we'll make sure to have those trimmed back regularly by a professional. I like how you mentioned that landscape lighting can also keep your house more secure. I've been wanting to make some improvements in my yard, and lighting is something I hadn't really considered in the design. Perhaps it would be a good addition for aesthetic and security purposes. Thanks for sharing this wondeful and informative article, nice job.